My daughter and my twin boys. 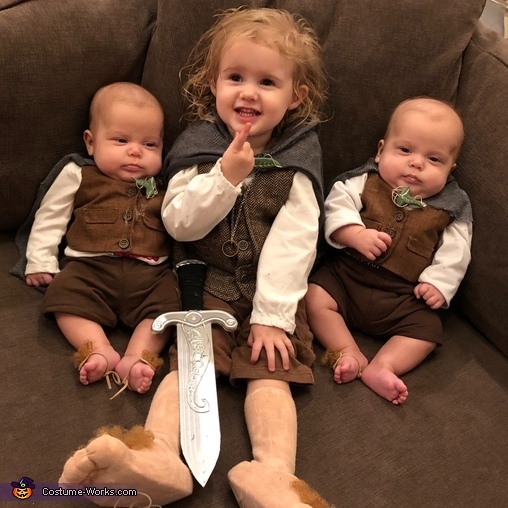 This homemade costume for families entered our 2018 Halloween Costume Contest. Here are my hobbit babies! My daughter, Emerson, will be 2 next month and my identical twin boys, Emmett and Finn, are 3 months old. I chose to make hobbit costumes for my children this year, simply because I am a huge Tolkien fan. I made 95% of what you see in the pictures and the other 5% I altered. Let’s start with accessories. -The one ring was ordered off Amazon, as I wanted a well-made replica. -The Leaves of Lorien were all handmade from a coke can, 20 gauge aluminum wire, acrylic paint, hot glue, clear spray paint and a brooche pin. I traced my outline and filled it in with a pen that didn’t work to give it a curved leafy look and then cut it out. I painted it, scratched away the veins and then applied the clear coat. I then glued the wire onto the back into the correct shape, filled it in with hot glue, attached the pin and then painted it silver to hide imperfections. I originally ordered one off of Amazon, as well, but as you can see in the picture it was horrible looking, so I made my own. -Her hobbit feet were made from an off brand of Crocs stuffed into an oversized sock. I added cotton balls down into the sock in front of the shoe and shaped them into toes using needle and thread. I then painted on the flesh color using a bottle of Covergirl foundation. I did not want to use paint because I wanted them to remain soft and pliable. I then glued on doll hair from the craft store and painted on toe nails. For the babies’ hobbit feet I glued more hair onto pieces of felt and attached it to suede string. -Sting was made from a $4 sword off of Amazon that I cut into shape. I added the Elvish and design in hot glue and then spray painted it a metallic silver. I then added the black suede string on the hilt. -Her pack and sleeping bag was sewn using fabric from Walmart in the clearance bin. I just measured her for the straps and made those. Drew out a simple pattern for the bag on the fabric and sewed it all together. I then added the button and loops on the side to hold the pots and pans. Those are from a Melissa & Doug set that she already had from her play kitchen. -Her vest was once again ordered off Amazon, but was entirely too large, so I brought in the side and shoulder seams to make it fit. The boys’ vests were entirely made by me. The fabric was once again found in the clearance bin. I drew out a pattern using a onesie for size. I watched a couple of YouTube videos for help and cranked them out in a day. Once trying them on, I realized my boys were chunkier than I thought and had to add fabric on the sides to make them fit. -The Fellowship cloaks were made from(you guessed it!) clearance fabric from Walmart. I did research on the fabric used to make them for the movie before I found the PERFECT one. A lot of people think that the cloaks are green, but they’re actually grey. It’s just the editing done post production that gives it that look. I found a pattern for them online, cut them out, sewed on the hoods and attached the hook and eyes. -All the pairs of pants were hemmed and I added lace ups at the front on the boys’ shirts. The ONLY thing that I didn’t do anything to is my daughter’s shirt. I think that about covers the how-to part! Unfortunately, we didn’t get to go trick-or-treating this year because we got rained out pretty heavily over here in Houston. It would have been my daughter’s first time and we were all looking forward to her getting to experience it. We did get some pictures and all of my family thought they looked super cute and hobbit-y. My aunt and father-in-law are also both huge Tolkien fans and they were both so excited. I hope to use my daughter’s costume for next year, but I might have to remake the ones for my boys, as they’ll be too big. I added some pictures of the accessories, so you can see the detail and process.